Karma Naturals - Organic Soybean Oil Nail Polish Remover - Polish Etc. I have a new to me product to share with you tonight. Nail polish and nail polish removers can be nasty and contain some not so great for you chemicals. I try to stick with 3-free products as much as I can and there are plenty of brands out there that are 5-free. But I am guilty of using acetone. Heck...I just bought a gallon jug of it from Sally's Beauty Supply last week and got a crazy look from the clerk when she asked if I was a nail tech and my reply was no. 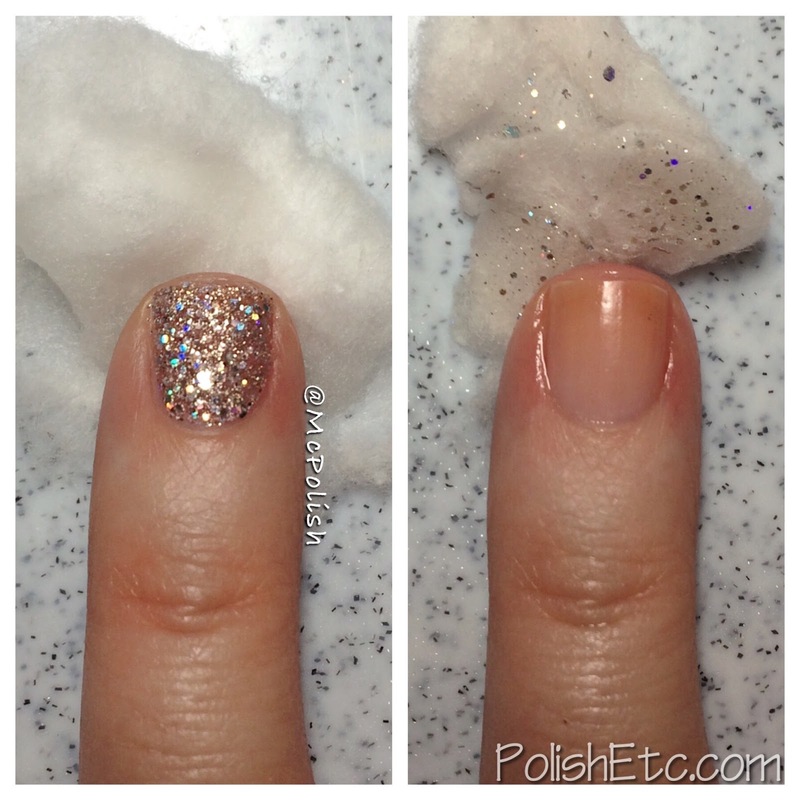 I use a lot of acetone, especially for clean up and stubborn glitter removal. It is super drying and not great to breathing in all the time. So, when oasisXchange contacted me about reviewing an all natural, organic remover available on their site, I was excited. You can heard me talk about oasisXchange before on my Takko Tuesday post here. They are an online retailer that only sells products from brands that are eco-friendly and gives 10% of every purchase to charity:water to bring clean drinking water to nations in need. Awesome, right? 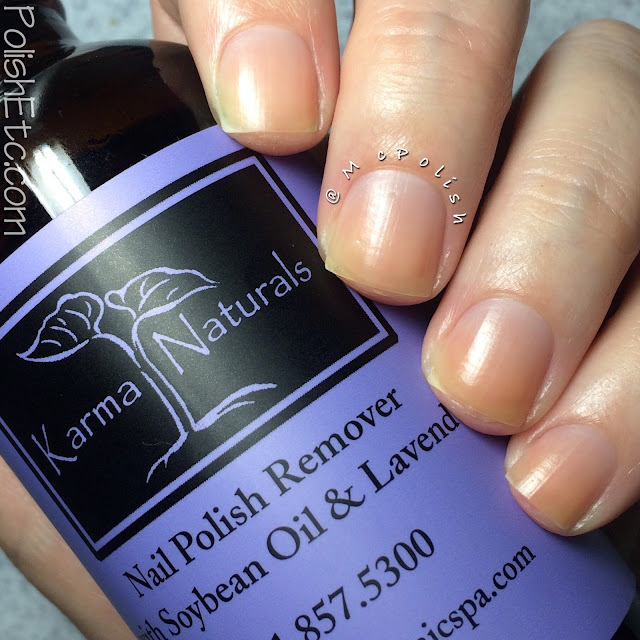 I was sent the Lavender scented Soybean Oil Nail Polish Remover from Karma Organics Spa. This company produces organic nail polish, nail polish removers, essential oils and other skin care products. The nail polish remover is soy based and non-toxic. There are two kinds of safe solvents used in this product as well as Vit E and Lavender essential oil. To be honest, I wasn't expecting this to work great. How can soybean oil remove this stubborn nail polish? But boy was I wrong! I used a piece of standard cotton ball with one splash of the remover and was able to remove all five nails on one hand with a plain creme polish. I did not notice any difference in the amount of time it took me to do this with the Karma Organics remover than it did with my regular remover, Zoya Remove+. For glitter polish, you do need to let the remover soaked cotton ball sit on your nail for a minute or two, but it still removed the glitter in the same amount of time as the Zoya Remove+. 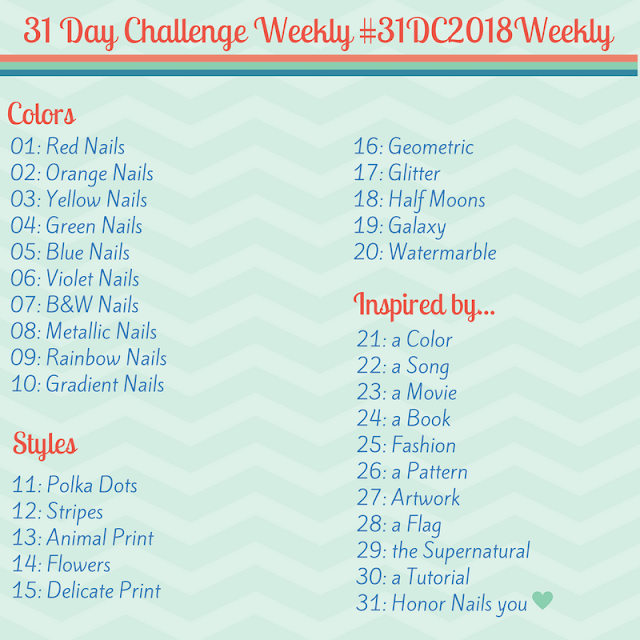 I even tested it on the mother of all glittery nail polish, Zoya's Magical Pixie Dust, and I still saw the same results as I did with regular remover. But what makes this natural nail polish remover so great is the soybean oil. My fingers and nails were not dried out in the slightest. The remover was actually moisturizing! The photo below is what my nails look like immediately after using the remover. The first few times I used it, I felt I needed to wash my hands afterwards because there was too much oil. But then I just started to rub it in after removing the nail polish and applied lotion. I let that sit and then applied my next manicure after cleaning my nail beds off with a little alcohol. For swatching, this probably wouldn't be my go to remover because of the extra time. But for a normal person that does a manicure once a week, this stuff is amazing. If you are looking for a non-toxic, non-drying, effective natural nail polish remover...this brand is for you! I have been using this bottle for a few weeks now and 100% approve!! You can get this from oasisXchange for $12 a bottle (4oz) and it comes in three varieties: Lavender Oil, Tea Tree Oil and Unscented. I have only tried the lavender scent and it was pleasant and not overpowering. I am a huge lavender fan, though. I really hope you give this remover a try. If you do, please let me know what you think and if you got the same great results I did. The special tipp is to not use cotton balls for removal, but some kind of fleece (simply some cleaning fleece). You cut it up to size and there are some, who just need a couple of drops on that fleece for all the nails. That way you can save a lot of cotton balls. And because the remover doesn't dry out in the air as aceton does, you could store the 'halfused' pieces in an airtight thingy and use it again next time. Thank you for the tip! I totally have some felt squares already cut out just sitting in a drawer. I will try this out for sure next time. Oh!! Thanks for sharing this!